Marja van Kampen was born in the Netherlands. She is a full-time painter and printmaker, receiving her degrees for Painting, Printmaking and Art History from the Akademie voor Beeldende Kunsten in Arnhem, The Netherlands. She moved to Ireland in 1982. She lived in Galway for many years, where she was a co-founder of Artspace Studios. 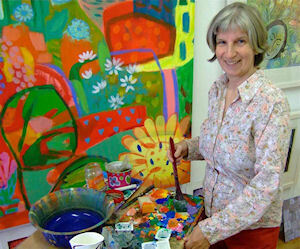 She recently moved to Enniscorthy, Co. Wexford where she set up her new art studio. Marja has exhibited her work with the Kenny Gallery, Galway, Graphic Studio Gallery, Dublin, Cong Art Gallery, Co. Mayo, Denis Collins Gallery, Wexford, Doorway Gallery Dublin. Recently she has exhibited in the Affordable Art Fair, London, in Artbank, Bunclody and the Opera Fringe Festival, Wexford. For a selection of work by Marja van Kampen click here.